Its only mid September and Holiday 2015 Makeup Bonanza has already begun! I have to say I have been waiting for the holiday season to begun eagerly! Almost every brand comes out with their versions of the holiday sets and palettes and you definitely get some very good deals around this time of the year! The very first palette to hit the market this year was the Hourglass Ambient Lighting Edit Palette. I do own the original Hourglass Ambient Lighting palette and love it a lot so when I saw that Hourglass was releasing another ambient lighting palette with blushes and bronzers I was super excited as I don't own any of the hourglass blushes or bronzers and this palette seemed awesome way to try them! A limited-edition wardrobe of powders, blushes, a bronzer, and the debut of the new Ambient® Strobe Lighting Powder—an illuminating powder designed to create the perfect highlight. This palette includes a Strobe Lighting Powder in Iridescent Strobe Light, two Lighting Powders in Dim Light and Diffused Light, two Lighting Blushes in Luminous Flush and Mood Exposure, and a Lighting Bronzer in Luminous Bronze Light. These products use Photoluminescent Technology, the optically transparent particles alter the appearance of the skin by manipulating and refracting favorable light. The result is skin that looks smooth, even, and enhanced—not masked. The soft-focus technology helps to minimize the look of wrinkles and imperfections, neutralize discoloration, and emulate the appearance of young, healthy skin. Packaging is absolutely gorgeous! Hourglass definitely does a fantastic job with their packaging. Its reflective metallic old gold which is so classy and elegant in my opinion. The only downfall would be that it does attract dirt and can get messy very easily. The palette comes with 3 Hourglass Ambient Lighting powders - Dim Light, Diffused Light and a new limited edition exclusive to this palette strobing powder Iridescent Strobe Light. The blushes in the palette are Mood Exposure and Luminous Flush with Luminous Bronze Light bronzer. The quality of the powders present in this palette is as good as their original ambient lighting palette and their singles. The powders are buttery soft with great pigmentation. 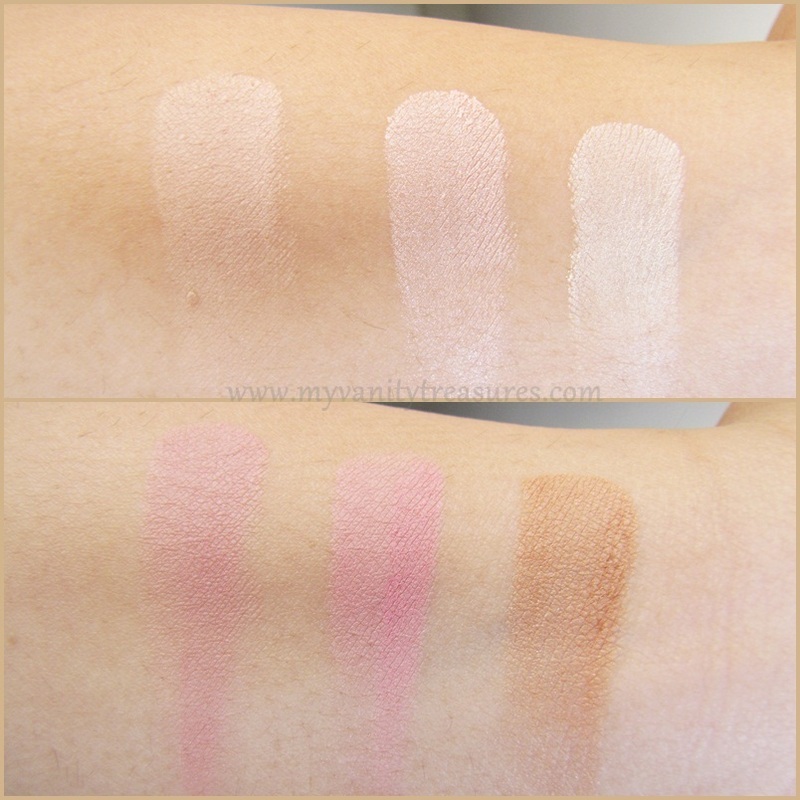 The blush shades chosen in this palette will work across all skin tones in my opinion. The bronzer is tad bit too light for my skin tone but if you have light to medium skin tone the bronzer will look gorgeous! Now coming to the most important part PRICE! The palette retails for whopping 80$ and approx 84$ with taxes. When I received the palette I was shocked to see the size of the palette! Its almost as small as my hands and I have tiny hands! Of course I was not expecting to get full size products but I thought the individual pan size would be same as the ones in original ambient lighting palette but to my shock the pans in hourglass ambient lighting edit palette are much smaller than original ambient lighting palette! Below is the comparison picture side by side of both the palettes and you can see how small the pan sizes are as compared to the original palette! For me personally I am in two minds, for the price I definitely expected more quantity plus not all shades work for me! I already own Dim Light as its present in the original ambient lighting palette. The new Iridescent Strobe Light is shimmery pale pink highlight with tiny chunks of glitter..not a fan! Diffused Light I love for highlighting under the eyes..it works great! I do love both the blushes especially Mood Exposure as it was already in my wishlist, though I would have loved Radiant Magenta or Diffused Heat but ah well Luminous Flush is also gorgeous. Finally the bronzer in Luminous Bronze Light is way too light for my skintone to work as a bronzer, it give more of a glow and works great as a topper over the matte bronzers. The only reason I may decide to keep the palette would be because of how travel friendly it is! You get your highlight, under eye setting powder/highlight, blushes and technically a bronzer into one! Plus buying any two full size products would practically cost more than this palette! But even so I am still debating on whether or not to keep this palette..I guess time will only tell! If you have never tried any of the Hourglass products , this palette is a great way to try the ambient lighting formula but if you already have the original lighting palette and singles of blushes/bronzer I'd say you don't need this palette. I hope the review and comparison was helpful, until next time take care and stay beautiful! I can see the smooth texture. The pink and bronze look gorgeous though it looks little pricey..
Renji I honestly dont think this palette is worth spending 128$$ rather get the full size in Sephora sale! The pans are only 1.6gms each and if you only want a couple of these better get the full size!